Come meet the Rebel Legion, Mandalorian Mercs, Saber Guild & 501st Legion! If you have ever been curious about who we are & what we do, this is your chance to find out! Want to join but not sure where to start or how? We can help! 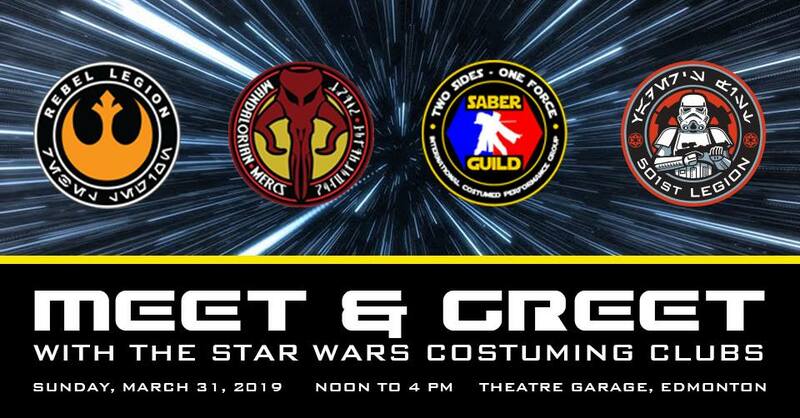 Join members of the local Rebel Legion – Outrider Base, Hett’ciri Clan – Alberta Mandalorian Mercs Chapter, Saber Guild – Echo Base Temple & 501st Legion – Badlands Garrison at the Theatre Garage for an informal “meet & greet” costuming & information session. -Answer questions and offer advise & suggestions on costume choice. -Provide information on our organizations. -Share tips on costume building techniques, methods & materials. -Answer questions on how to join our clubs & member requirements.